Jordan Keras was the pick of the Cats’ midfielders collecting 18 possessions to go along with a game-high 14 tackles. Geelong’s VFL side has finished their preseason campaign with a loss on Saturday, falling to Casey 7.9 (51) to 12.7 (79). Early stages of the match were impacted by wet weather, making for some scrappy football from both sides. The Demons were quicker to adapt to the conditions and took a 10-point lead into the main break. Playing against the breeze in the third term, the Cats couldn’t convert their limited chances and their opponents made them pay, with Casey extending their lead to four goals by three quarter time. The final term started with a Geelong fightback as they closed to within two goals but a late surge by the Demons put the result beyond doubt, with the Cats falling by 28 points. Despite the final score, Geelong coach Shane O’Bree believes his players will learn a lot from the quality opposition they faced. “I thought it was a really good hitout for our boys,” O’Bree said. It caps off what has been a beneficial series of practices matches against high quality opponents. “It is not so much about winning, but about the chemistry and development of players, I think every week we have gotten better with that,” O’Bree said. 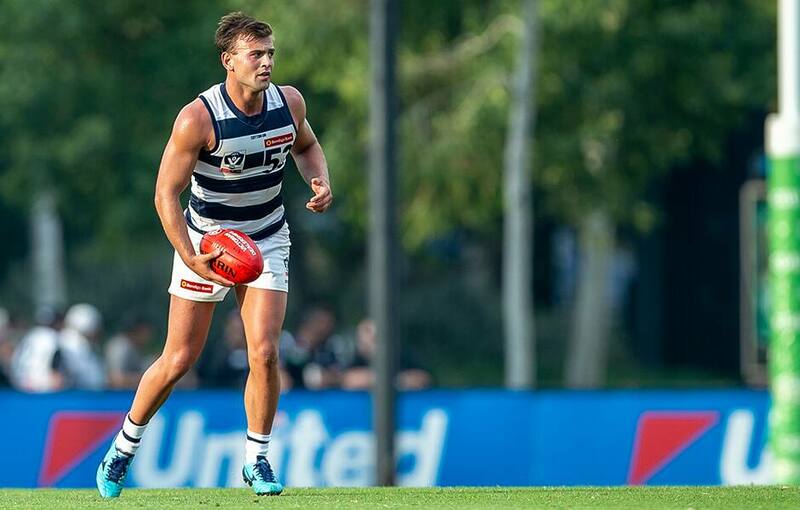 Jamaine Jones, Lachie Henderson and Ryan Abbott played limited game time but all impressed, with the latter two claiming spots in the Cats’ best. Wylie Buzza presented well on a tough day for talls and was the Cats’ only multiple goal kicker while Darcy Fort racked up 20 hitouts, 13 touches and a goal. Keras was named the Cats’ best player, followed by Jackson McLachlan, who had 18 disposals himself, 13 of which were contested. “Jacko McLachlan played inside mid all game, showed his footwork and his ability around the contest,” O’Bree said. The Cats will kick off the 2019 VFL season at GMHBA Stadium on Friday night when they take on Richmond.